OS Language: English, Polski, Russian, Deutsch,Spanish, Czech, etc 23 language. 2.No peeking to the projector lamp as the projector is working,otherwise easy to damage your eyes. 4.No waterproof function,please keep projector away the rain or moisture,and can not put any liquid items such as vase cup those. 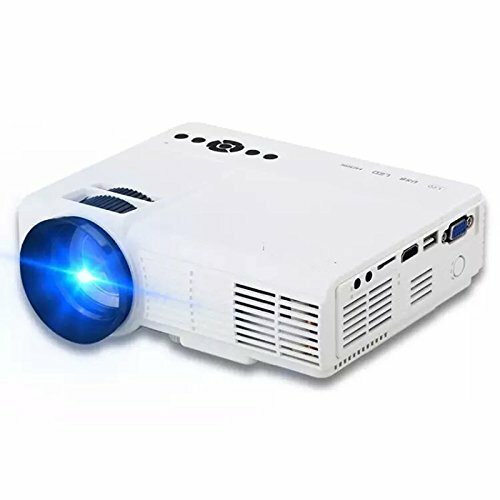 5.Turn off,and cut off the power supply,if long time not use projector. ▶【3 Years warranty】professional customer service and Technical Support. - you can contact us if you have any confused about install the projector or other problems. ▶【Wonderful Watching Experience】32-170 inches,with the distance of projector1.5m-5m,We suggest that the best of projection is about 2-2.5m with 120 -130 inches Size,which can make you obtain the best User Experience. ▶【Multi-Function Input】Support HDMI/VGA/USB/SD/AV/TV input, Audio out, also has built-in speaker, connecting PC, Laptop, DVD for movies, enjoy games on big screen by connecting Playstation PS3/PS4, WII or XBOX via HDMI port. You also can use your smartphone connecting the projector by HDMI adapter.